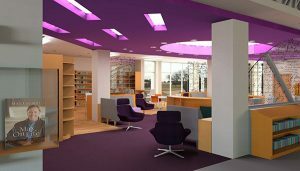 The Reading Commons renovation will remodel the east side of the Learning Commons into a community space for reading. This area will be full of new and recommended books and periodicals. New shelving, comfortable seating and tables, and good lighting will encourage browsing and reading. A presentation space will support special literary events, including poetry readings, book signings, and celebrations of faculty publications. 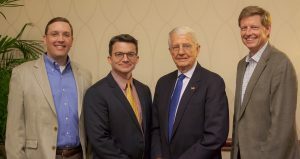 Pictured from left to right: Lance Reider (’98), foundation officer; Dr. John Weaver, dean of library services and educational technology; Ray Hansen; and Jim Orr, J.D. (’86), vice president for advancement. This project is funded by a generous gift from Ray Hansen (‘53) in memory of his beloved wife, Nancy (‘53). When completed, the new space will be named Nancy and Ray Hansen Reading Commons. The Reading Commons will also feature an preservation-quality exhibition case that has been funded by an anonymous donor in honor of Max Lucado’s recent donation to ACU of his personal and professional papers. The case will display rare books and archives from the ACU Special Collections, including a permanent display of artifacts and documents from the Max Lucado Collection at ACU.